You've now added California Dream Tours to your itinerary. Take a break from Los Angeles with a short trip to Disney California Adventure Park in Anaheim, about 38 minutes away. There's still lots to do: examine the collection at The Getty Center, have some family-friendly fun at Virtual Room Los Angeles, explore and take pictures at Dodger Stadium, and take a leisurely stroll along Santa Monica Pier. To find more things to do, reviews, photos, and more tourist information, go to the Los Angeles road trip planning tool . Boston to Los Angeles is an approximately 7.5-hour flight. You can also do a combination of bus and flight; or drive. The time zone difference when traveling from Boston to Los Angeles is minus 3 hours. In June, plan for daily highs up to 79°F, and evening lows to 62°F. Cap off your sightseeing on the 19th (Wed) early enough to travel to San Francisco. 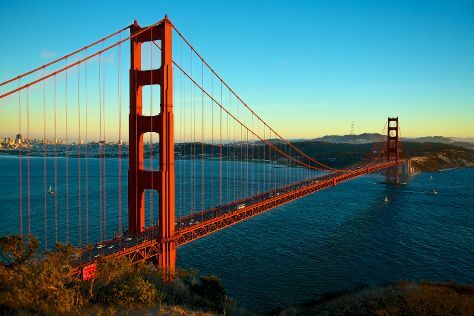 On the 20th (Thu), head off the coast to Alcatraz Island, take in the waterfront at Fisherman's Wharf, then don't miss a visit to Lombard Street, and finally snap pictures at Golden Gate Bridge. Here are some ideas for day two: engage your brain at Exploratorium and then don't miss a visit to Golden Gate Park. For ratings, more things to do, maps, and more tourist information, refer to the San Francisco itinerary maker website . Traveling by flight from Los Angeles to San Francisco takes 4 hours. Alternatively, you can do a combination of flight and train; or drive. Traveling from Los Angeles in June, expect San Francisco to be little chillier, temps between 71°F and 55°F. Wrap up your sightseeing by early afternoon on the 22nd (Sat) to allow enough time to travel back home.